I will be the first to admit that red typically is not my first choice when it comes to clothing items. I don’t know why, but I use to shy away from the color. But this season, I am all about it! If you have not noticed, red has been everywhere this fall and I must admit, I have fallen for the hue. I have seen celebs and top fashion bloggers in head to toe red looks and I am obsessing over how great the color looks on everyone! Although I may not be ready for all red everythang just yet, I am loving the way a pair of red boots makes a simple yet bold statement! When I saw these boots on JustFab, I absolutely had to have them. Adding red boots to your look will instantly take your outfit up a notch! Red boots are definitely a must have this fall. 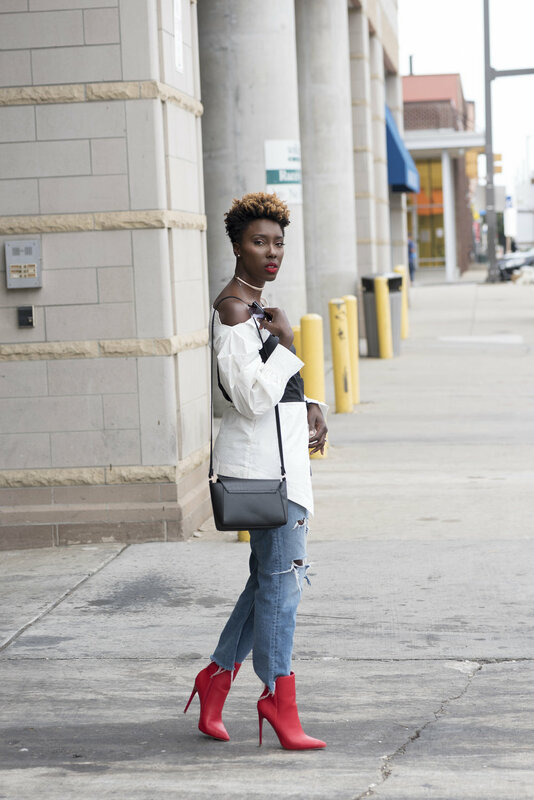 I paired my red boots with boyfriend jeans from H&M and this awesome top from Shop Brown Sugar collection. While we are at it, let’s take a moment of silence for this top! I seriously can’t get enough of it. Another trend I have been loving this fall, is corset tops paired with button down blouses. This shirt offers both pieces as one top-yes! It also shows another one of my favorite moments, which is an off the shoulder look that I absolutely LOVE! I can’t get enough of this outfit and these red boots! Let me know what you think, and if you are here for the red!